The Ultraflex UltraSafeGait™ is a custom-molded Adjustable Dynamic Response™ (ADR™) AFO with a posterior calf shell and SMO. It is designed for patients with early childhood equinus (extension gait moment) soleus spasticity with flexible rear, and mid and/or forefoot deformities. Ultraflex's exclusive Adjustable Dynamic Response™ (ADR™) technology is designed for managing gait dysfunction. Ultraflex ADR™ addresses the limitations of conventional orthoses, including the limitations associated with solid AFOs, hinged AFOs, carbon dynamic, ground reaction AFOs, DAAJs, and stance control orthoses (SCOs). This breakthrough technology eliminates limitations associated with conventional orthoses by providing customized treatment of deficits resulting in a more biomechanically normal gait. The technology presents compensating orthotic intervention for each phase of the gait cycle. With Ultraflex's ADR™, unprecedented stability and motion is now available to the developing child with challenging neurological presentations such as cerebral palsy. Adult patients in the acute and chronic phases of neurological recovery with conditions such as post-stroke and post-polio have been benefiting from the technology since January 2004. The UltraSafeGait™ Adjustable Dynamic Response™ (ADR™) AFO pediatric version complements Ultraflex's pediatric therapeutic line of stretching braces which are designed to increase muscle length for the growing child with spasticity. Children with movement and posture disorders can now fully benefit from the gains in muscle length achieved with Ultraflex therapeutic bracing while ambulating with UltraSafeGait™. This is made possible because unlike conventional orthoses, UltraSafeGait™ provides for a patient-specific, optimal functioning gait. UltraSafeGait™ Adjustable Dynamic Response™ technology provides a sought-after orthotic solution for the heretofore unmet orthotic needs of children with crouch gait types, equinus gait types, and all of their variants. This revolutionary technology provides patients with natural range of motion (ROM) that is stabilized, thereby limiting the compromises often associated with conventional orthoses. UltraSafeGait™ Adjustable Dynamic Response™ technology provides adjustable muscle augmentation, stability in stance, smooth/natural rollover, and clearance in swing, making Ultraflex's technology unparalleled. UltraSafeGait™ for children and UltraSafeStep™ for adults Adjustable Dynamic Response™ (ADR™) technology is the result of nearly two decades of collaboration, research, and longstanding associations with multidisciplinary professionals in the field of movement and posture disorders, gait analysis, and physical rehabilitation. Ultraflex technologies uniquely address the rehabilitation challenges associated with preserving and restoring movement, posture, balance, and strength. The rehabilitation team's clinical assessment values and treatment goals drive our individual brace design, making the individualized orthotic intervention truly a patient inspired solution. This success story is about maintaining independent ambulation when there is a diagnosis of Duchenne Muscular Dystrophy (DMD). Meet Omar. 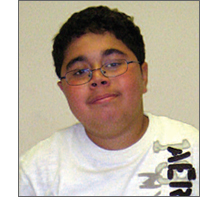 Omar is a big brother, honor student, avid swimmer, gamer, DMD hero, and Ultraflex user. Omar has been using Ultraflex braces for over four years. During the first year of use at age eight, the family reported improvements in walking. By age 12, Omar's dorsiflexion ROM had increased significantly. Omar is maintaining his range, demonstrating heel-toe gait, and continues with independent ambulation. Ultraflex stretching braces maintain and increase muscle length and improve passive range of motion with precise dynamic stimulus and proper posturing. Specific to Omar's case, Ultraflex technology was used to increase and maintain dorsiflexion ROM for continued independent ambulation. Clinical contribution to this report from Cidny Fox, CPO of Orthotic Solutions, Fairfax, Va. 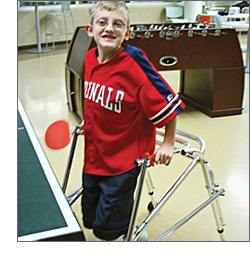 This success story is about managing crouch when there is a diagnosis of spina bifida. Meet Jacob. Jacob is a swimmer, T-Ball player, video gamer, and St. Louis Cardinals fan. Jacob has been wearing braces since he was one. Until switching to Ultraflex, night bracing was not well tolerated. Jacob has been using an Ultraflex stretching brace and Ultraflex Adjustable Dynamic Response™ (ADR™) functional braces for one year. The family reports that Jacob is getting the stretching he needs, has improved balance and stability, and is more upright – all of which has given Jacob greater function. An Ultraflex stretching KO is being used to maintain and increase Jacob's ROM and to improve comfort and compliance. Ultraflex Adjustable Dynamic Response™ (ADR™) AFOs are being used bilaterally to control dorsiflexion, provide normal range, augment instability, and improve balance. The Ultraflex stretching KO worn at night/at rest is easily connected/disconnected to/from the ADR™ AFO with the Ultraflex UltraQuick Release™. The KAFO, billable as one brace, addresses the multiple treatment goals involved with crouch. The brace makes it easy for Jacob to stretch while playing a video game and then have the KO easily disconnected from the ADR™ AFO for a game of ping-pong. Overall balance and stability has improved as a result of the Ultraflex KO and ADR™ AFOs used in combination. Clinical contributions to this report from Kevin Smith, CO, LO, FAAOP of O&P Labs, St. Louis, and Courtney Dunn, PT, DPT, of St. Louis Children's Hospital. 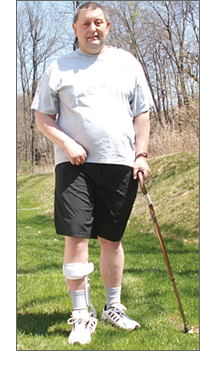 This success story is about meeting the changing orthotic needs of a post-stroke survivor during the first year of recovery and forward with one orthosis. Meet Fred, a retired painter, outdoor lover, dog owner, and Ultraflex user. An Ultraflex Adjustable Dynamic Response™ (ADR™) KAFO with an UltraQuick Release (UQR™) mechanism gives Fred knee/ankle stability and motion, and selective muscle augmentation. As Fred progressed, muscle augmentation was lessened, PT continued uninterrupted, and the KAFO was converted to an AFO. The result was improved compliance and fewer learned compensations. Ambulatory status progressed from moderate assist with a hemi walker to independent ambulation with a single point cane. Early physical therapy goals included promote safety upon hospital discharge, stabilize knee and ankle, address muscle weakness and changing post-stroke physiology. Fred was fitted with an Ultraflex Adjustable Dynamic Response™ (ADR™) KAFO with an UltraQuick Release™ (UQR™) mechanism. ADR™ provides stability and motion, and selective muscle augmentation allowing for a more natural gait during the most active stage of neurological recovery. 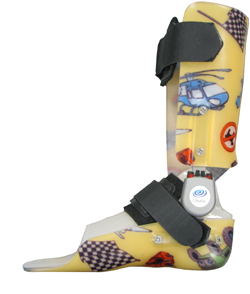 The UQR™ allowed for an easy conversion from a KAFO to an AFO when progress indicated that less bracing was needed. Patricia Wright has a passion for education and advocacy and has dedicated her career to ensuring that individuals with autism are fully-included in society. Her personal mission is to offer the support that makes it possible for people with autism to lead meaningful, happy and productive lives. As Easter Seals National Director of Autism Services, Wright leads autism programs for Easter Seals, one of the nation's largest providers of services for individuals with autism across the life span. Wright's expertise as an educator and Board Certified Behavior Analyst inform her individualized approach to creating effective treatment plans. She knows that early diagnosis and intervention offer the best outcomes but also is a proponent of appropriate treatment for anyone with autism at any age. Everyone has the ability to learn and develop skills. She is a member of the Organization for Autism Research's Scientific Council and is currently serving on the Executive Committee for the Friends of the Center for Disease Control and Prevention's National Center for Birth Defects and Developmental Disabilities. Wright is experienced working with national media and well known as a presenter and has been invited to deliver presentations and conduct training across the United States and internationally. 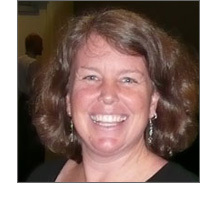 Wright earned her Ph.D. in education from the University of Hawaii in 2006. She also has a master's of public health from the University of Hawaii, and a master's degree in special education from San Francisco State University. Wright earned her bachelor's degree in education at Central Washington University. The sequester is a set of automatic spending cuts put into law by the Budget Control Act. Signed by President Barack Obama in August 2011, that legislation raised the debt ceiling and sought to apply pressure on Congress to come up with a longer term plan for deficit reduction. As required by law, President Obama issued a sequestration order on March 1, 2013, effective April 1, 2013. The $1.2 trillion in budget cuts will be spread over nine years and are equally divided between domestic and defense-related spending. During the remainder of the 2013 fiscal year, $85 billion worth of cuts are set to go into effect. The budget cuts would end in 2021. As of April 1, 2013, health care providers began seeing reductions for provided services. The impact to physical therapy is seen in the areas of rehabilitation research, education and Medicare payment. APTA also expects the sequester to result in a 5-7 percent cut for NIH funding and a 5-8 percent cut for the department of education. Medicare claims with dates-of-service on or after April 1, 2013 incur a 2 percent reduction in Medicare payment. Claims for durable medical equipment (DME), prosthetics, orthotics, and supplies will be reduced by 2 percent based upon the date-of-service, the start date for rental equipment, or multi-day supplies. The claims payment adjustment will be applied to all claims after determining the coinsurance, any deductibles and any Medicare Secondary Payment adjustments. Though beneficiary payments for deductible and coinsurance are not subject to the 2 percent payment reduction, Medicare's payment to beneficiaries for unassigned claims is subject to the 2 percent reduction. CMS encourages Medicare physicians, practitioners, and suppliers who bill claims on an unassigned basis to discuss with beneficiaries the impact of sequestration on Medicare's reimbursement. Medicaid and the Dept. of Veterans Affairs are exempt from sequestration. Please feel free to submit your questions on the Ultraflex Pediatric Ankle/Foot Orthosis as well as any other issue you would like addressed.